Here we go with a sequel to Tuesday's post: A new simultaneous whisky review! Click on over to My Annoying Opinions to see MAO's review (direct link) of this same single malt. I have no idea what he thinks of it. No, seriously, nada. After Tuesday's dual post, I am fascinated by the unique experiences two people have with the same whisky, and in this case from the same bottle. I don't even know what anyone else thinks of this stuff because there are no other reviews of it online (that I can find). Though it's missing its commonly provided first name, this is indeed OLD Pulteney. And it's actually old. The oldest Pulteney I'd had until this point was the 17 year old official bottling, which I quite adore. I've never had an indie Old P, though I do have a younger one awaiting me in The Stash. Here's what I've gathered about the naming of the whisky: The distillery is Pulteney, it is situated in Pulteneytown, a once-thriving fishing village named after Sir William Pulteney. The product issuing forth from the distillery is called Old Pulteney. 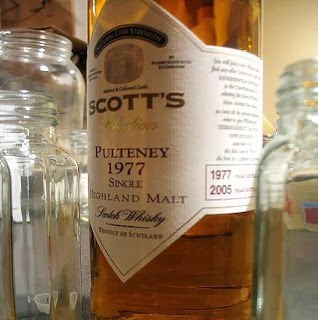 I've seen a couple other independently bottled Pulteney malts leave the "Old" off the name, but most of them seem to keep it attached. In this case, Scott's Selection is basically listing the distillery's name and the year of distillation. I saw this bottling before in one of those random Scott's spottings I'd mentioned on Tuesday. In fact, there was some considerable whisky-lust-at-first-sight, but alas she was too costly for me. Thus many thank yous are owed to MAO, who organized a four-way split of this bottle he found in his home state. The color (see MAO's pic above) is slightly darker than the Highland Park, edging towards the light gold area of pretty whisky shades. At first sniff, the nose gives off a blast of something pretty phenolic, which is unexpected. Sadly, it has never returned. Early primary notes are of bread, yeast, a nice lychee/floral thing, and saline nasal spray. The fruits which are in the background ease out with some air; mostly peach schnapps and fresh apples. Give it more than 30 minutes of air and some bubblegum and "old lady" perfume. (Quotes per my notes.) The palate shows lots of salt and plenty of heat. There's also a solid wall of tartness. Those who don't like the salt and tart in the OBs may want to give this wide berth. There's an occasional subtle mothball (naphthalene or menthol?) note. After some time in the glass, the whisky reveals some unsmoked tobacco and plain cookies (think stale ladyfingers). That tartness continues in the finish and is met by milk chocolate, a hint of vanilla, and dried apricots. It can be a little astringent, so some air helps. Curiously, I get some medicinal character and cigar smoke lingering in my mouth for awhile. Now the fruits arrive in the nose. The peach schnapps is bested by fresh peaches. And cherry lollipops. Some tropical fruit too, probably mango; I also wrote papaya in my notes, but it's been a long time since I've nosed a papaya (Sexual imagery unintended). There's also some fresh grass and pine sap, along with sugar cookies. The palate gets narrower. There's some lightly rummy sweetness before a hoppy IPA bitterness moves in. The tartness remains. The finish gets sweeter. Bitter and floral notes tangle (or tango). The pine sap shows up here too along with a little cough medicine. So. Phenols in Old Pulteney? Wut? Due to the dearth of reviews on this whisky, I went to the source that is Serge's site. Though he hasn't reviewed this particular Pulteney, he has reviewed 59 others. I was specifically looking for something from the '70s or earlier. He mentioned some possible peat in a couple of them, but the only one he seemed confident about peating was this Whyte & Whyte specimen from 1974. Do I think this Scott's Pulteney was peated? I can't be 100% certain as the nose note did not return when I went back to the whisky this evening. I still get that medicinal and smoky thing in the finish, but that could possibly from the spirit and/or barrel. So, I don't recommend going to this whisky expected something peated, in fact you'll get more of a peat kick from officially bottled Clynelish (which, like Pulteney, supposedly uses unpeated malt, but its results often contradict that). I'm wondering as I'm typing this, did MAO find any smoke or peat? He found more of it in the HP than I. And I'm probably making a much bigger deal out of this issue than it deserves because the characteristics in question were brief. More importantly and totally subjectively, I really liked this whisky. As I mentioned above, it's loaded with the salty tartness I like the official Old Pulteney range. It can be a bit tight on the palate, but it hits the right spots for me. The remainder of my quarter bottle is going to vanish quickly. We're much closer this time, but no, I didn't get the peat/smoke. And I didn't get quite as much tropical fruit as you but I'm hopeful that it's there. I re-tasted it and took some additional notes (it changed for the better in the two weeks) as you'll see in my review, but the second pour was a much smaller one--with a larger pour and more time I'm sure there'll be more palpable fruit. Alas, I've been unable to find the peat note again in the nose. It looks like the tropical fruits you found were in the palate, while the ones I found were in the nose. I agree that the nose was more interesting than the palate, but this was a good pick. Thank you for hunting it down! I'm going off topic but don't go into the K&L Hollywood store unless you plan on weeping (in joy or sorrow). David OG seems to have come across some really rare bottles of old rye (which is even pre-Prohibition), bourbon, and single malt. The one that just popped up in the online catalog that looks real tempting is a Glenmorangie 19 year old Port Wood from the mid-90's for $899.99. Oh, and there's also a Brora Rare Malts for $1,299.99, Port Ellen Rare Malt (same price as the Brora), and a Glenlochy Rare Malts at $1,399.99. Not bad for a series that never made it here. When did OG suddenly become a procurer of rare malts? OG knows some people. And he also knows some people who know some people. That's not meant to be cryptic. He just knows some people. I'd LOVE to see those old old old American whiskey bottles. But I don't know who's going to pay $900 for a '90s GlenMo. Maybe someone who also bought the GlenMo Pride? They do have a few left. It's a good thing they kept the hype on that one down to a minimum. Or is that a bad thing? I don't know anymore. $900 for a '90s Glenmo Port Wood ??? Even for 1975 one this would be a bit too much... not to talk about the Standard Port Wood Finishes. They would go between 100 and 150 bucks. The pricing makes so little sense to me, that I'm just going to shrug my shoulders on this one. Some people clearly have too much money lying around. I hope they keep spending it on questionable semi-dusties and stay away from my preferred distilleries. Actually I really hope they get involved with charities and put their cash to better use.